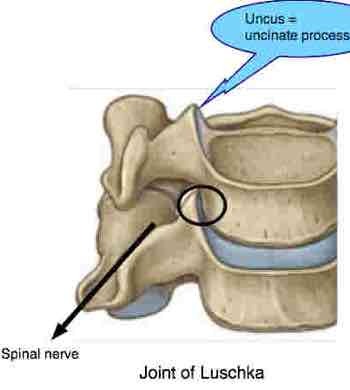 An enlarged uncinate process begins to irritate the spinal nerve. I had right rotator cuff surgery, a severe rupture like a 98% tear. After 8 months of PT, I started a work reconditioning program design to mimic heavy lifting and pushing, reaching and stacking of heavy luggage as a airline employee working on aircraft. After a few months of strength and work reconditioning I complained to PT about pain in rhomboids right side. Was told to stretch a lot and ice. Two days later pain increased with neck stiffness and pain running down my right shoulder to the triceps area but still continued to exercise with weight program. After a week neck stiffness increased and pain going down right shoulder to tricep area continued. Exercises stopped, 2 weeks after that I started getting tingling and numbing sensation with pins and needles like feeling going down the triceps area, over to the forearm and ending in my right hand and fingers. What would you think caused that? It's intermittent and relief comes when I shake arm and place point to the right or putting right arm on my lap. Month later no stiff neck, no shoulder tricep area pain, just crazy pins and needles, arm and right hand going numb. Please help. I have been referred to a neck and spine specialist. Why? You have been referred to a neck specialist because this is a typical cervical spine issue. I'm speculating obviously but the course of events might run like this. First an old whiplash that was not well managed at the time; degenerative stiffness and immobilisation arthritis gradually set in, affecting the joints of Luschka. The uncinate process becomes enlarged and begins to irritate one or more nerves that supply the arm and rhomboid area; and ache and weakness slowly progresses in the shoulder affecting in your case the rotator cuff. One of the muscles rupture, probably with the help of a cortisone injection which weakens the tendon. The shoulder is treated, but the underlying cause of the whole business still has not been addressed; pain and tingling in the arm develop. Does this sound familiar, or am I way off course? The first step is an x-ray, probably followed by an MRI of your lower neck. Then, having seen the surgeon for his opinion, you have to decide whether to go Medicine, or give Chiropractic a chance; much depends on the extent of the injury in the cervical spine as to whether a course of adjustments would help. Identify precisely which fingers are affected.